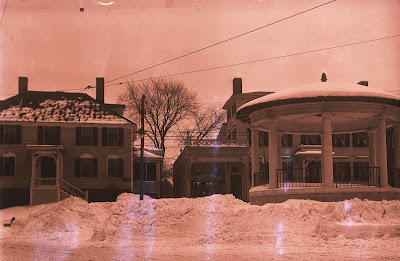 Swasey Pavilion, or Exeter's "Bandstand", between 1916 and 1929. “Start at the Bandstand…” begins many a direction given by an Exeter resident to either a newcomer or a passing motorist. What is this Bandstand? 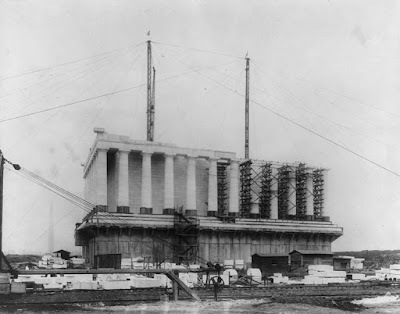 When was it built? What story does it have to tell? 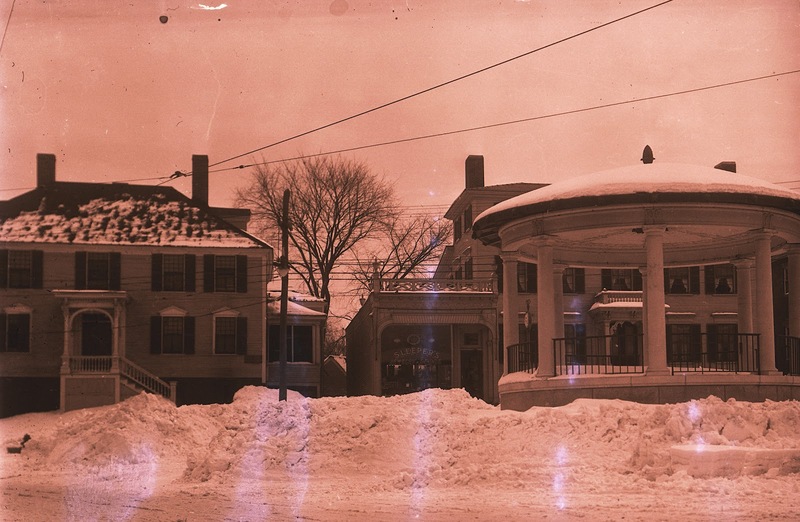 Some accounts of Exeter say it was built in 1913, others say 1917. One way to find out is to look in the old News-Letters, but more important -- first ask the town clerk, Evelyn Zarnowski, who keeps a little book of the most frequently asked questions. Looking under “B” for Bandstand or “S” for Swasey Pavilion, she finds that 1916 was the year; then you are referred to the town records for 1916 and find that a special town meeting had been called for a Saturday evening. John Templeton read the resolution as is recorded in the town records and also The News-Letter for Jan. 14, 1916: “The citizens of Exeter, in a special town meeting assembled, hereby accept the offer of Mr. Ambrose Swasey to beautify the Square by erecting an ornate Pavilion therein, and the town clerk is directed to convey to Mr. Swasey, a loyal and distinguished son, the deep appreciation of the Town of Exeter for his beautiful gift. 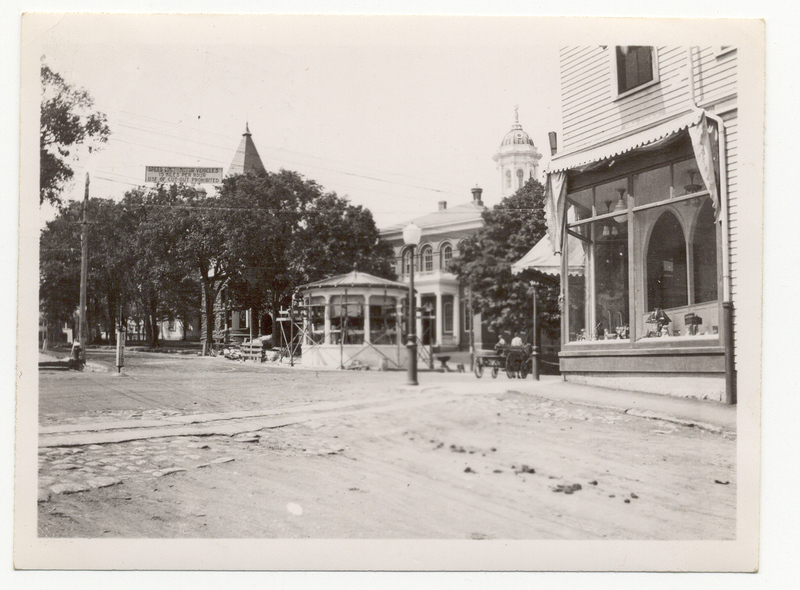 “Work preliminary to the erection of the Pavilion in the Square, the welcome gift of Mr. Ambrose Swasey began Wednesday when the fountain was removed to a site at the Town Hall corner. There it is intended to place it in temporary operation. “On Wednesday also began the digging required for the Pavilion foundations. At a depth of four feet was found a deep layer of oyster shells. The trusses and other steel material was hauled to the Square yesterday. “The marble floor of the Pavilion is nearly laid and the laying of curbing around the enclosure has begun. 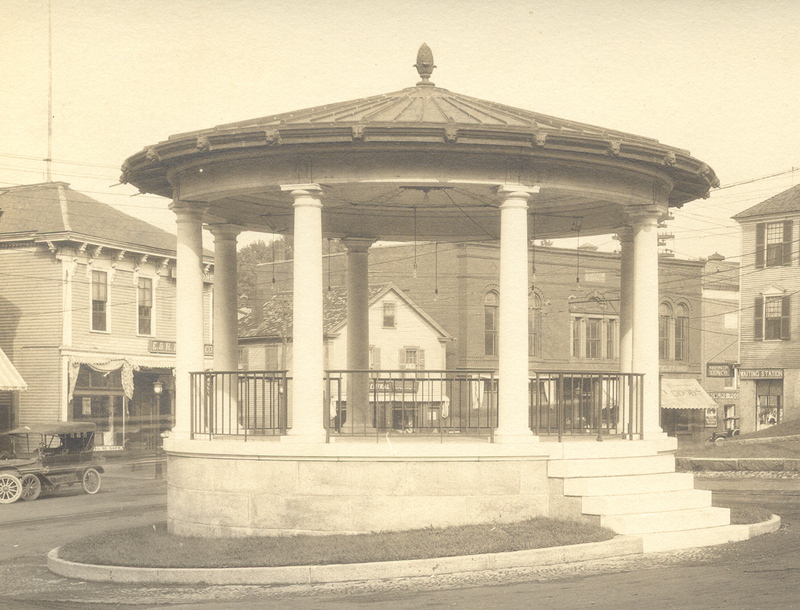 “The Pavilion in the Square will be dedicated at 8 o’clock next Wednesday evening. Hon. Albert S. Wetherell will preside. There will be music by the Exeter band and addresses by Rev. Dr. S. H. Dana and, probably Hon. John Scammon. (Hon. Edwin G. Eastman had died before the Pavilion was completed.) The donor, Mr. Ambrose Swasey, will present the Pavilion key to the selectmen. It did indeed rain that Wednesday evening, August 9. 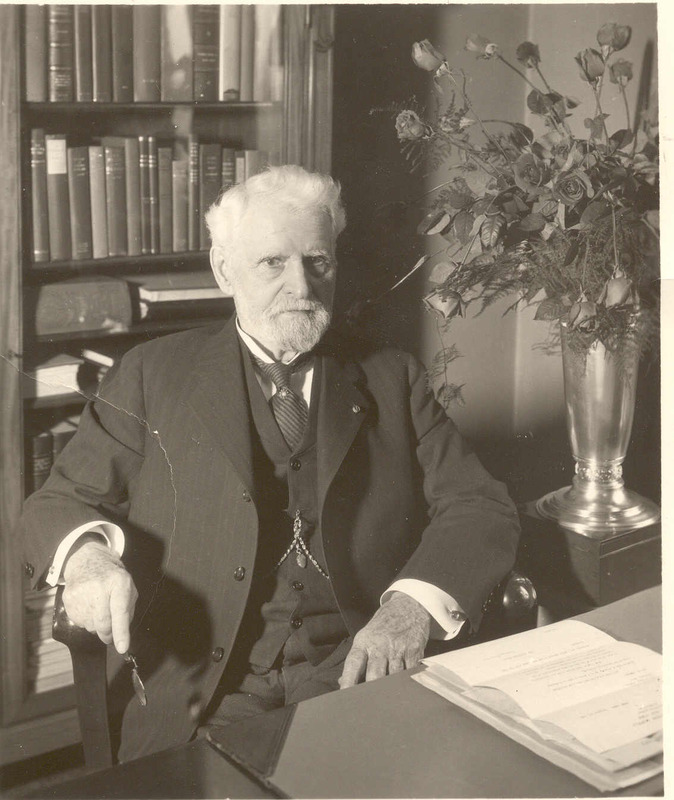 The “next fair evening” proved to be August 10, when many gathered in the square to thank Mr. Ambrose Swasey for his “sumptuous gift to his birthplace.” “It was said” that Daniel Chester French got his idea from a pavilion in the gardens at Versaille. The dedication was largely attended. Hon. 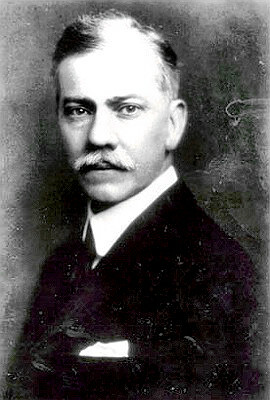 Albert S. Wetherell, of the committee which had supervision of the erection, presided. Its other member, Rev. Dr. S. H. Dana, made a felicitious address. It will be recalled that in the summer of 1915 no little curiosity was aroused by Mr. Swasey’s visit to the Square with a distinguished son of Exeter, Mr. Daniel Chester French, and Mr. Henry Bacon, of New York, one of the country’s most eminent architects. Alluding to this visit, Dr. Dana outlined its results and devoted much of his address to the notable trio. Greeted by hearty cheers and applause, the public-spirited donor then presented the Pavilion keys to the selectmen, with acceptance by Chairman Clarence Getchell. Music by the Exeter Band completed the programme. “The Pavilion is of exquisite beauty. Upon deeply laid foundations of concrete rest three courses of pink Milford granite, which constitute the ashler. Then comes a course of white marble, from which rise eight graceful columns of marble which support the marble architrave. The steps are marble. The floor is of re-inforced concrete, with marble surface save for the central bronze plate showing the zodiac, especially fitting in view of the donor’s interest in astronomy, and the encircling mosaic work. The enclosing railing and gate are of bronze. “The mosaic ceiling, in its design and the rich colors of its central sunburst and delicate tracery, is a gem. From its center hangs a bronze chandelier of pleasing design, with eight arms pointing to the columns. There are electric lights at the extremities of the arms and a ninth pendent from the center. “There is much ornamental work in the copper roof, notably the 16 gargoyles, lions’ heads, and the pine cone finial. “About the Pavilion is a narrow plat which turfed Monday, enclosed by granite curbing, and around this is a finely paved border. Great post! Thanks for the excellent article.